The glass houses at Edinburgh's botanical gardens contain a vast array of exotic species, from tiny flowers to massive oversized fronds. 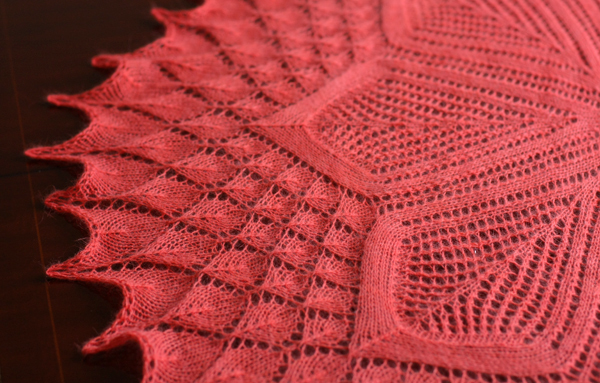 This shawl is inspired by the elegant geometries found within this natural treasure box. The botany pattern is available as an individual pattern download, or as part of Handmade in the UK. sizing Small (Large) shawl measures approxmiately 56 (68) inches wide by 22 (27) inches deep. Finished size will depend on yarn choice, gauge, and how aggressively you block the finished piece. 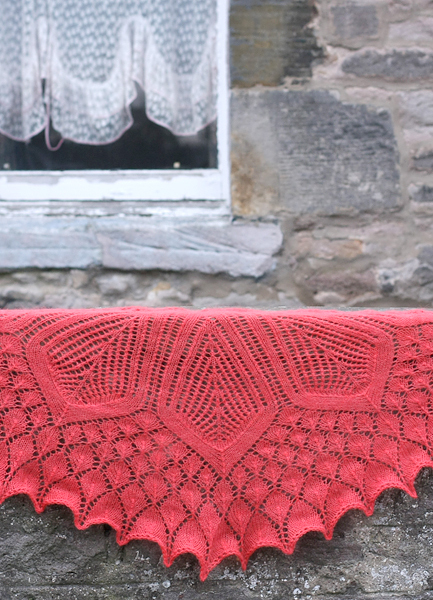 notes This crescent shawl is worked from the top centre in rows of increasing length to the outer edge. The lace is made by working a series of motifs (these are the large petals), and later by inserting smaller-scale lace panels between these motifs as they decrease to points. Lace patterns are charted. Lace is worked on right side rows only, wrong side rows are simply purled.